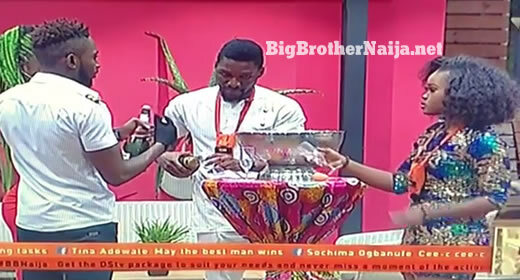 Last night Big Brother congratulated the Big Brother Naija 2018 finalists by surprising them with bottles of win in the garden. The five Saved Housemates could barely contain their joy at being in line for the Finale. 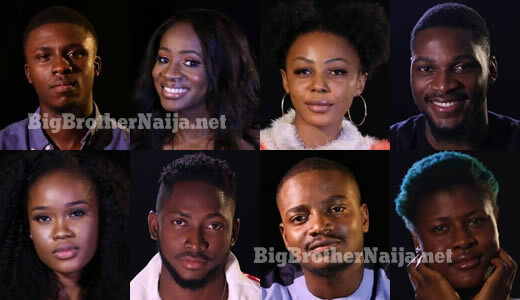 Tobi, Alex, Miracle and Nina found themselves to be the lucky few who had survived the final Eviction that saw Khloe, Anto and Lolu leave the Double Wahala House. Emotions were at the peak last night as Nina and Alex couldn’t hold their tears back – overpowering rivers of joy mixed with disbelief and gratitude at having been Saved. They had barely started pouring the bubbly that Cee-C walked back through the doors, to her peers incredulous faces. Cee-C had come back fronting an inscrutable face nonetheless exuding a certain arrogance as she seemed to take delight in the disappointment her return had caused. Expectedly, she retreated to the garden area to savour her fate while talking to her fans and praying for strength. Yet Biggie had more surprises for the shrunken House, as one by one, video messages recorded by friends and family emerged on the screen. In the lounge, Tobi, Miracle, Cee-C, Nina and Alex were overwhelmed to see and hear messages from their loved ones. As Nina and Alex cried their eyes out, Tobi, Miracle and Cee-C jumped for joy elated as they were by such unexpected encouragements. The looks on their faces when the queen walked in, PRICELESS. 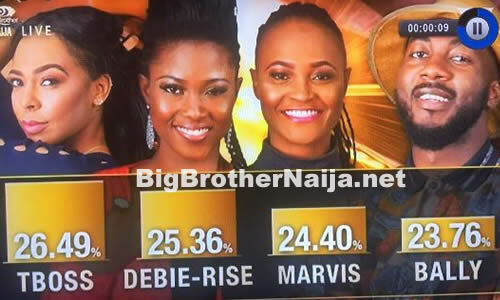 LOl they all thought Cee-C had been evicted, especially Tobi and Alex, these two hate Cee-C so much. But they'll be shocked next Sunday on the Grand Finale day when they realise that Cee-C has a bigger fan base than both (Tobi and Alex) of them combined.. Team Cee-C please lets all keep voting for our queen. I hear i don't like her in this house..is it your father's house.. some people don't have sense.. Big brother if only you had evicted 2 pax last sunday.. this childish gal won't be in that your house nwa its your house ooo… First person to be evicted coming Sunday thou, i will ensure that by only voting for Miracle…. I feel sorry for Lolu who really deserved to b in the final and had to be sacrificed by Big Brother. Its just not fair ! But lets not do a comparison of who has what! People will think we are big-headed! but I was soo happy & my Cee-C did not disappoint with her Queen attitude &tendencies! & people will be saying she is bitter when those people could not even move when they saw her! Their jaws dropped & my Cee-C could care less! Shame Lolu….Come guys we have 4 days to go, go crazy if you have to…This woman has received HATE more than anyone in the history if BB just for being herself. @Anonymous I agree with you, people will start saying she's bitter for owning her space, Who cares though.